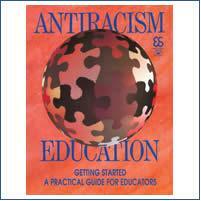 Anti Racism Education is a guide produced by Ontario Secondary School Teacher’s Federation (OSSTF). Anti Racism Education is a resource which seeks to help teachers address and execute anti racism and ethno cultural equity in schools. OSSTF believes “This guide will address concerns related to the needs of visible minority and aboriginal students.” By addressing equity in areas such as “school codes of behavior, curriculum issues, bias in language, school-community interaction and assessment/evaluation materials”, the guide seeks to promote an all inclusive educational environment. For information on OSSTF and Anti Racism Education guide visit http://www.osstf.on.ca/Default.aspx?DN=7453,4263,1091,365,Doc uments.